Local Bail Bondsman New York City: What Can They Do Legally? 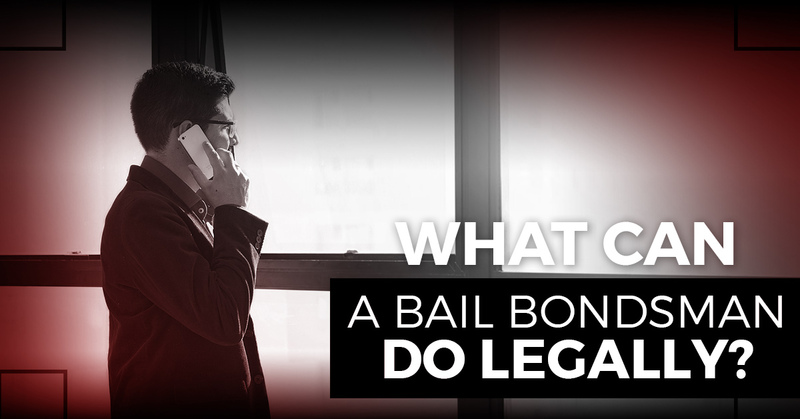 What Can a Bail Bondsman Do Legally? In previous blog posts, we’ve discussed how to post bail and how exactly bail bonds work. But what many people fail to realize is that their local bail bondsman is on their side. Unfortunately, these same folks believe that a bail bonds service can essentially “hold them hostage” during one of the most difficult times in their lives. Keep reading to learn what a bail bondsman can and cannot do legally. Let’s refresh your memory with the basics of bail bonds. A bail bond, also known as a surety bond, is guaranteed by a state licensed bondsman who is backed by an insurance company. Keep in mind that the bail agent guarantees the court full payment of the bond if you fail to appear for scheduled court appearances. For the purpose of this post, let’s say that you skip your court appearance. Now the ball is in the court of the bail agent. They can either pursue the fugitive on their own to make an arrest or hire a bounty hunter. Since they aren’t government agents, bail bond agents aren’t required to seek out a warrant. That said, a bail bondsman must keep all paperwork identifying them as authorized to seek out and detain the fugitive while doing so. Because of their specialized work, bail bondsmen can only do so much in this regard. They may not be able to make an arrest on their own, however, they can always turn to the proper authorities should they ever need further assistance. What Makes ABC Bail Bonds Different? Unfortunately, bail bond agents tend to get a bad rap for what they do. While some agents can be rude and intimidating, that’s not at all the case with our team. At ABC Bail Bonds in New York City, our mission is simple: to help clients get out of jail as quickly as possible. We constantly help folks who had never previously worked with a bail bonds service. You can feel comfortable knowing that we will never rush you through the process or treat you like a number. Our licensed and trained agents are happy to answer any questions you may have. You may be wondering what sets ABC Bail Bonds apart from other bail bonds companies in NYC. To start with, we are a third generation business with over five decades of experience. In addition to expediting the process, clients also appreciate that we treat cases with discretion and confidentiality. Posting bail for a loved one can be a traumatic event. During a time of chaos, you can lean on us to remain calm and make good decisions. Creative and flexible, our agents make it a point to always go the extra mile for clients. We hope that you notice the difference our training and experience can make in getting your family through a difficult time. For your convenience, we accept all major credit cards, checks, and offer easy payment plans. Are you looking for an emergency bail bond? Don’t hesitate to turn to us for 24/7 bail bonds. From domestic violence bail bonds to DUI bail bonds and everything in between, let our skilled team bail you out of a tough situation.